According to a recent release by Eurostat, the statistical office of the European Union, the volume of retail trade increased by 0.1% in the euro area (EA19) and by 0.2% in the EU28 for the month of February 2018, after falling by 0.3% in the euro area (EA19) for the previous month. Retail volumes were flat for EU28 in January 2018. Year over year, the retail sales index increased by 1.8% in the euro area and by 2.0% in the EU28. What caused the annual rise in retail volumes differ from the cause of the uptick in the monthly report. The 1.8% increase in the volume of retail trade in the euro area in February 2018, compared with February 2017, was due to rises of 2.3% for non-food products, 1.2% for “Food, drinks and tobacco”, while automotive fuel fell by 0.1%. On the other hand, the annual 2.0% increase in retail trade volume within the EU28 was attributed to the following increases of 2.4% for non-food products, 1.4% for automotive fuel and 1.2% for “Food, drinks and tobacco”. 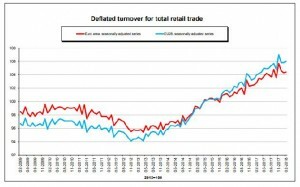 The highest increases in the total retail trade volume were registered in Malta (+11.7%), Poland (+7.9%) and Ireland (+7.1%), while decreases were observed in Slovenia (-1.6%) and Austria (-1.2%).